Chore-Time’s Vike Aviary is offered in a standard or stepped configuration with two manure belt tiers and one nest tier. 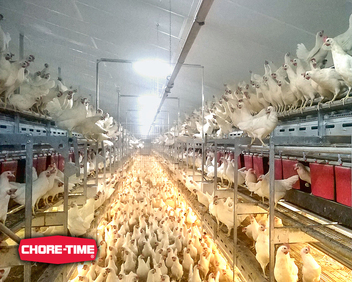 MILFORD, Indiana, U.S.A. — Chore-Time now offers Vike Aviary Systems as part of its acquisition of the Volito Group, a Netherlands-based designer and manufacturer of cage-free egg production systems. These aviary systems are proven to provide outstanding results with multiple configurations and system widths available to suit many poultry house layouts including multi-story houses with integrated flooring. 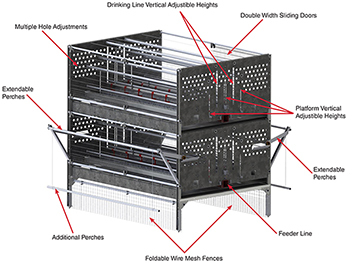 Vike Aviary Systems are designed for ease of movement for hens throughout the poultry house. They feature a low height, helping them fit in existing houses and allowing full visibility of the aviary. They are available in the VIKE-2 vertical configuration or VIKE-5 stepped configuration. Both configurations include two manure belt tiers and one nest tier, and the two configurations can be combined within the same poultry house to create the optimal layout. The systems can be configured to meet all recognized cage-free regulations around the world. Additionally, Vike Aviary Systems have integrated Valego™ Nest Systems, which are available with highly efficient rack-drive expulsion (RDE) or moveable-floor expulsion (MFE) systems. They feature smart “Click & Fix” assembly of nest walls and roofs, as well as other features that allow the systems to be installed and maintained easily using common tools. The nest systems also offer durable, A-grade, film-faced plywood construction, which provides a sturdy, quiet environment for birds that is easier to clean and more durable than plastic or steel. AstroTurf® nest pads are also included for improved hygiene.